“A” wakes up each morning in a new body. “A” has done this every day for the whole of their existence, and doesn’t question it any more than we question waking up in the same body every day. Then “A” meets Rhiannon and wants to have a ‘normal’ life. This is a difficult book to review. Not because of the content or writing. It’s a lot simpler than that, and a lot harder: “A” is without a pronoun. They are completely non-corporeal – without a permanent body. “A” is neither he nor she, and I’m going to be forced to call them It, to give them the overtones of a non-person. It feels like the wrong approach, because “A” is such a strong character, labelling them as It feels…rude. Derogatory. “A” has a unique narrative voice, one I have never come across, or even contemplated – one without gender. Gender is so tied into every book I’ve ever read, that having a character without gender, with a constant shifting body every day is disorientating. The only way I could relate to “A” is to read them as a male character. A female friend is going to read it and I’m really fascinated to see if she reads “A” as a female. I wasn’t sure I wasn’t projecting my male narrative voice onto “A”. I needed a gender to work with. That isn’t an issue with the book at all by the way; just my perceptions of reading it. The book itself is wonderful. “A” is eloquent, warm, emotive, caring, passionate. If you wanted a friend for life, “A” would be it. “A” feels every moment of every day, living entirely in the present; it’s all “A” can do before It moves on. Because of “A”‘s unique perspective on life, “A” notices details the rest of us would miss. The shoes Rhiannon wears; the callous on her thumb; the texture of sand through a host’s fingers. “A”‘s language is lyrical and powerful, the soul of a poet. We get to touch lives from the inside with “A”, feeling the tragedy of a girl who can’t stop drinking; the first funeral “A” ever goes to; a girl who wants to commit suicide. But also the joy as well; a gay pride parade with “A”‘s host’s boyfriend. Gender or sexuality doesn’t matter to “A”; only the emotion. So we get to see “A” as girl with another girl, a boy with another boy. Love is all that matters. Through it all, “A” loves Rhiannon; it doesn’t matter if he’s a girl or boy, black or white. “A”‘s only thought is to be back with her, and It breaks Its own rules of ‘non-interference’ to do it more and more as love takes over. It’s great writing, but the book does have problems – hence the not-perfect rating. There are plot holes left undeveloped – most significantly, is “A” the only body-hopper? – and the subplot with a boy who remembers being ‘possessed’ by “A” just fades away. And then there’s the epilogue. It’s only eight or nine lines, but it wasn’t needed, and only left confusion. What “A” knows, and the rest of us barely realise, is that the package love comes in doesn’t matter; only the emotion matters. It’s a message that Levithan carries off with panache and style, with wonderful passages of lyrical and emotional writing, and a tearful punch of an ending. Superb. 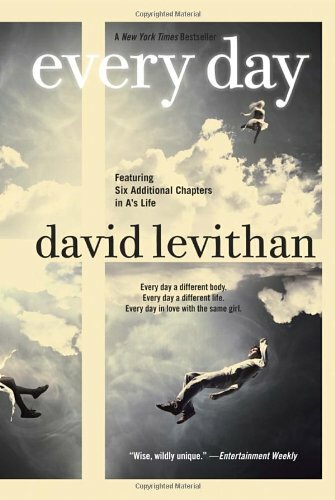 This entry was posted in Reviews and tagged 4/5, david levithan, every day, Reviews, tony talbot, YA. Bookmark the permalink. I would be fascinated to see if a woman reads “A” as a female narrator…amazing concept for a book!